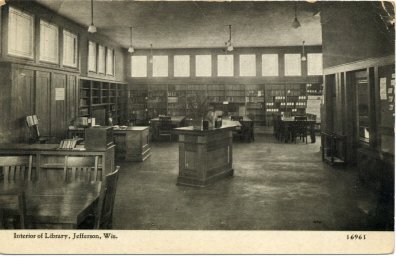 I recently purchased a postcard on eBay showing the interior of the Jefferson (WI) Public Library, a Carnegie library building. Wisconsin library postcards is one of the categories of postcards that I collect, and interior views of libraries are not common. Only the picture side of the postcard was displayed on eBay so I was pleasantly surprised to find that the message side of the postcard had several interesting library connections. I had to work a little to discover all of those connections. 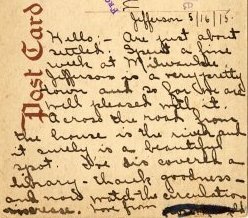 The postcard was mailed form Jefferson, WI to a public library in Wisconsin. 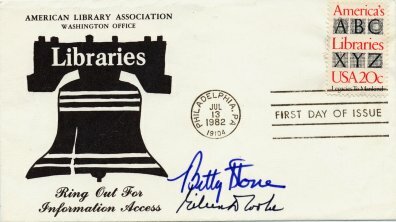 The name of the person to whom the postcard was sent and the name of the city in which the public library was located were obscured. Under close examination I determined that a likely candidate for the city was Superior. I had been in recent contact with Teddie Meronek, Area Research Librarian for the Superior Public Library, about another library history question, and I contacted her for the name of the director of the Superior Public Library in 1915, the year the postcard was mailed. She let me know that the director was Blanche L. Unterkircher, and again with close examination it was almost certain that this is who the postcard was sent to. The message on the postcard reads: “Hello: Am just about settled. Spent a fine week at Milwaukee. Jefferson is a very pretty town and so far we are well pleased with it. Across the road from the house is the river and it surely is a beautiful spot. I’ve discovered a library – thank goodness – and now watch the circulation increase. Love from [crossed out].” There are two stamped messages on the postcard. One states “From the Picture Collection of the Art Dept. 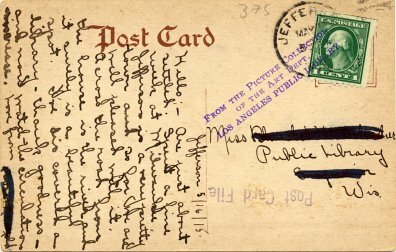 of the Los Angeles Public Library” and the other “Post Card File”. 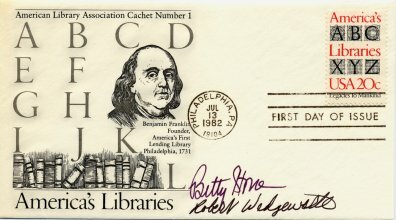 How the postcard got from Wisconsin to the Los Angeles Public Library is still a mystery. 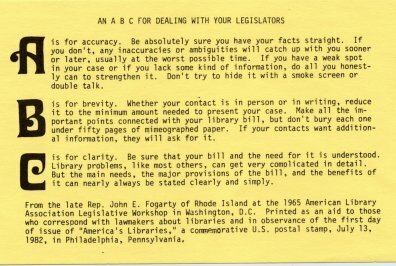 The postcard like many public library postcard collections was probably deaccessioned at some point and went into the hands of a postcard dealer. Now the postcard is back in Wisconsin. It is a shame that someone felt that it was necessary to obscure the names of the postcard recipient and sender, but regardless I'm glad to add it to my collection.